Now you can make your booking and make the payment through any cargills food city outlets island wide. 1. Search for any travel product. 2. Select preferred search option. 1. You can walk into any Cargills Food City outlet. 2. You should fill the " Cargills Cash Deposit Slip". 3. It is a must to write your correct Booking ID in the Slip. 4. 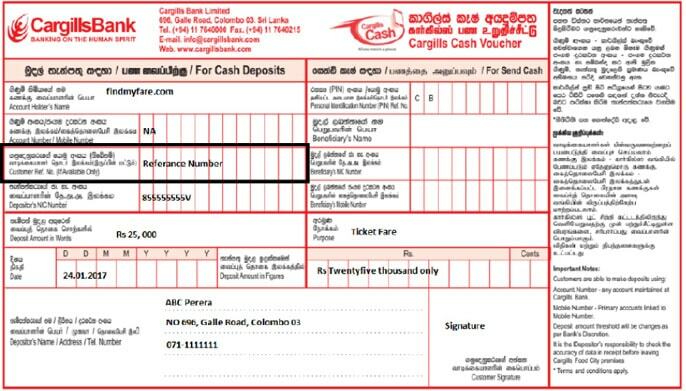 Refer below sample "Cargills Cash Deposit Slip". 1. E-ticket/voucher will be sent to you once the payment receive via Email. Your Customer / Your Agent walk into any Cargills Food City outlet to make the payment. Customer fills “Cargills Cash Deposit Slip”. Visualization of the payment slip you will use at the counter.